Watch out for the bird I said to Noel F. Williams. We were at the Volo Bog in Volo, Illinois enjoying Winter Fest. Lake Shore Vibe rocked the place with four sets during the afternoon. Visitors went on hikes in the snow to see nature at work and the photo contest brought the outdoors inside. Here’s Noel about to be captured by a Red Tail Hawk. We see these birds of prey in our yard at times. Today is the Winter Solstice in the Midwest. It’s cold and snowy here in Chicago as we get closer to year end. The sun set at 4:21 last night for the shortest day of the year. Today we start the six month journey to summer solstice when we enjoy the longest day of the year. In the Chicago area, it does not become fully dark until 9 PM in late June. That is my favorite time of year. Until then, I’ll enjoy the few minutes of additional daylight each day. The sun rises one or two minutes earlier and sets a moment or two later each day. Giuseppe’s La Cantina is a favorite place my family. We have been welcomed by the Brunetti family since 1963 when they opened their doors in Des Plaines, Illinois and our extended family gathers for dinner once a month. We held our wedding rehearsal dinner there too. Originally started as Nicks’ La Cantina by brothers Nick and Giuseppe, the restaurant has gone through expansions, renovations and transformations through out the years. The place even rose like a phoenix after a fire closed their doors a few years back. The family business is grateful for customers who have stayed with them through the years. We are now bringing our third generation of our family for dinners. Once again, the family is giving back to the community. The Brunetti family knows there are those who are struggling through these challenging times and they want to help. They are offering a free, full course Thanksgiving meal for those who have been or are in danger of foreclosure. Reservations are required at (847) 824-4230. I spoke to Mary this afternoon about the event. She said reservations must be received by Monday to allow her time to order and prepare the turkeys. If you are in the mood for a great pizza or Italian dish any other day, drop by Guiseppe’s at 1062 Lee Street. Tell them April sent you. I recently attended a networking event in Chicago’s north suburban Glencoe. The event was held in a mansion at 458 Lakeside in Glencoe, Illinois. This 10,000 square foot home built by Adel Tarakdjian of Tara Designer Homes is available for private events like the one I attended. The couple hundred people at the session comfortably roamed all three level plus the lower level of the home, patios and gardens. Our host for the evening, master networker Dan Felix. What a great way to market a home in this economy. By renting out the facility, a few hundred people a night visit the showcase home. Rental fees generate income and during our session, Adel gave a short commercial on his company and background on the home. You can see professional photos at the website but to get a real feel for the property, you have to see it to believe. Even the mini kitchen and wine storage on the third level were spectacular. Fourteen years ago John Baur and Mark Summers concocted the Talk Like a Pirate idea. When playing racquetball, they began cursing each other in a pirate like language. They promoted this event annually with mild success. Once Dave Barry and Long John Silver’s restaurants got behind the idea, things went viral. It served them well. T-shirts, books, and speaking engagements followed. John parlayed this into a move deep into pirate territory with his current home base now St. Croix. Here’s primer to get you started on talking like a pirate. At least it is not another Hallmark holiday. To find out more check out the Official Talk Like a Pirate Day website. To read more about how this annual event got started, read the CNN article. Tiki’s Grill and Bar has one of the best locations in Waikiki. With a vast view of Waikiki Beach and the Pacific Ocean, this a favorite spot for locals to meet for cocktails and dinner while catching a beautiful sunset. Just a few weeks ago we were hanging out with friends at Tiki‘s in Waikiki. There was a Twitter organized meet up with Chris Pirillo tech writer for CNN, the night after we got into town. For us, it was a great way to visit with many of our new and old friends at one time. We ended up leaving the party early as we were still on Chicago time. I barely stayed awake till 8:30 there which is 5 hours later on Chicago time. I’m not often awake at 1:30AM. You can watch video and read more on this Tiki’s event and other interesting friends. I ran across one of the photos today of a few of our favorite tweeple. Check out these dudes having a fun time! 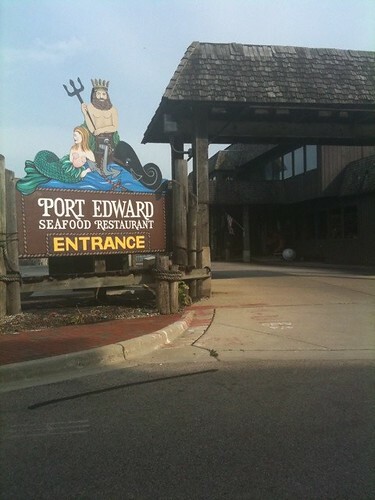 We founded a new monthly networking session at Port Edward in Algonquin. Buffet breakfast and lively, thought provoking conversation for just 10$. Best deal in town. All are welcome. First Wednesday of the month from 8:30AM – 10AM. For more info visit our website. This morning I facilitated our discussion on sparking latent energy. Sparks of ideas were ignited!